Tianjin: Verify everything, don’t forget anything! On August 12th, at 22.50 (China local time), there was a warning of a small fire in one of the industrial warehouses in the district of Bihai, in the port city of Tianjin, China. Some firemen rushed to the scene. Some 40 minutes later, there was a tremendous explosion equivalent to 3 tons of TNT, and some seconds after that another brutal explosion, equivalent to 21 tons of TNT, which could be seen even via satellites surrounding the earth. Why was this explosion so terrible? These warehouses are not just the usual ones; they were warehouses of dangerous products with more than 3 tons of products potentially harmful to any human being. All of them were situated in an industrial zone where only workers are living. It seems that the calcium carbide that was stored could have reacted with the water that was used by the firemen to extinguish the fire, transforming itself into an explosive acetylene. An explosion of acetylene would have been enough to detonate a chain reaction of other products that were stored there, causing an even far bigger one. At the moment there are 114 deaths and initially 720 people have been treated in hospitals. We should add that the warehouse had also stored 700 tons of sodium cyanide, a highly toxic substance for human beings; and there is fear that it might have intoxicated the whole zone. Behind all these facts and figures one thing is hidden: the inhuman logic of capital, a new infliction on the working class, paid for in blood, a new offensive against everything that is human on this planet. In 1915, in his pamphlet ‘The enemy is in our own country’, the revolutionary Karl Liebknecht said: “The enemies of the people are hoping that the masses will forget… We fight this with the following means: Verify everything, don’t forget anything! Don’t forgive anything!”. This slogan is still valid today. Why was there a warehouse stuffed with such material, if not for the need to reduce costs, to maintain the accumulation of capital? Why have workers been living so close to these monstrous piles of explosives, if not because the Moloch of capital needs to maximise the use of space filled by the exploited and humiliated population? We need to remember that those accidents are not isolated cases, but a chronic problem of capitalism in general and Chinese capitalism in particular. In its Sunday edition of 23rd of August, the Spanish newspaper El País titled its report: ‘Industrial insecurity: an endemic problem in China’. There we are told that between January and May 2015, industrial accidents caused 16.000 deaths and there were 26 explosions like the one in Tianjin, with a total of 65 deaths. China is not an exception according to the ILO (International Organisation of Labour), because in 2014 2,300,000 people died as a result of industrial across in the world. In its phase of decomposition capitalism loses its capacities for a ‘healthy’ coordination and functioning, what little was there in the first place. For this reason they sent firemen to extinguish a fire in a warehouse that was full of substances that reacted violently when they came into contact with water. So they lost their warehouse, their industrial infrastructure and the port activities came to a standstill in a port which is a transit point for 40% of all imported vehicles. The mining giant BHP Billiton suspended all its port activities. Renault lost 1,500 cars and Hyundai 4,000. Toyota and John Deere halted their production. 17.000 buildings are damaged…. Capitalism's crazy drive for accumulation is turning against itself, like a gigantic fist. Capitalism is demonstrating that its survival generates monstrous contradictions, which are increasingly difficult to control and which lead to ever more dangerous waves of destruction. But if the bourgeoisie suffered losses with this self-inflicted catastrophe, the proletariat has lost more. What does all the industrial production of Toyota, John Deere and BHP mean, compared to the life of one single worker? To all those workers who lost their home or even worse, to the workers which this infamous government wants to relocate to this zone, even though is poisoned with cyanide? Nothing! Against this cruel reality, against these continuing humiliations imposed by the bourgeoisie and the Chinese government, there have already been some small protests. Verify everything, don’t forget anything! Don’t forgive anything! 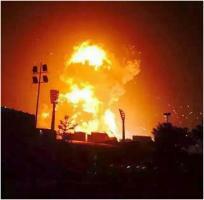 Tianjin is murder! This article was contributed by a sympathiser of the ICC in Spain.